ePublishing Knowledge BaseePublishing Knowledge BaseePublishing Knowledge Base Creating and Managing EventsHow do I create group sales discounts for events? To set up pricing, set the minimum and maximum quantity (example: from 1-5 seats at the event) and the price associated with each. 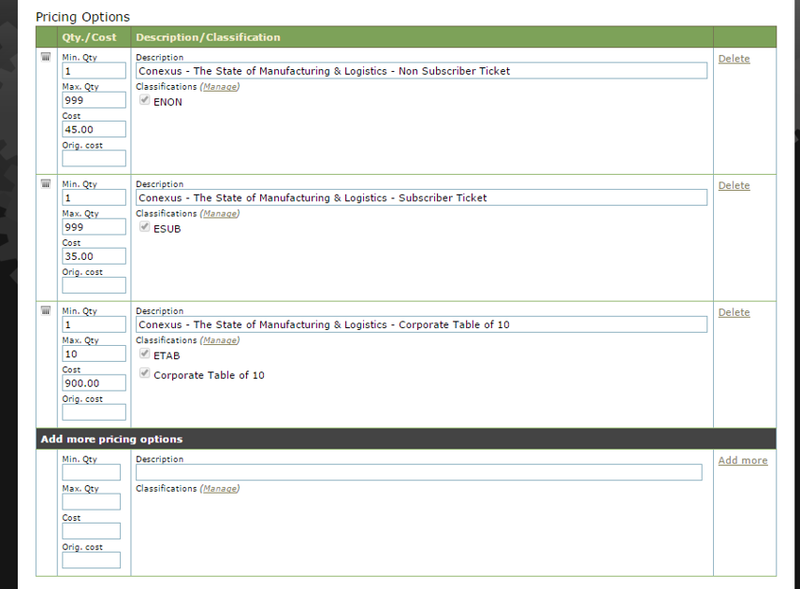 To assign a Classification to your event - for example, Corporate Table - click Manage next to the word Classifications and click the box next to the appropriate taxonomy. Here's an example of what pricing may look like for your event. Classifications are customized by website. Contact your solutions manager for questions on classifications. Prev: What are the available layouts for event pages? Next: How do I create and use event templates?